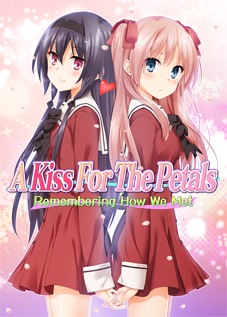 Original product announcement page for the visual novel A Kiss For The Petals (その花びらにくちづけを Sono Hanabira ni Kuchizuke wo), translated by Ralen. An updated edition is included as part of the First Series Complete Set. See the original page for image and voice samples. 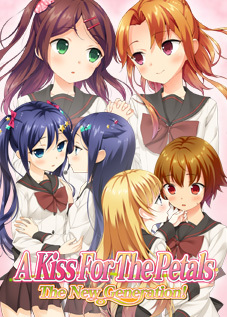 We bring you the first release from doujin game circle Fuguriya, A Kiss For The Petals! 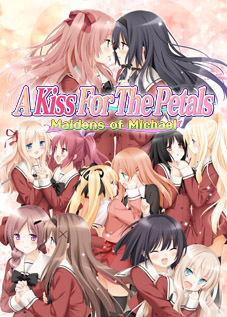 Our protagonist, Nanami, finds a mutual attraction with Yuuna, the upperclassman she idolizes, and the two become lovers. And not one single meddling male character appears (lol). The talent is incredible, too! And the game system has it all! She’s like a sculpture of my ideal woman. She’s my perfect idol! Ahh, I’d die of happiness!! But, one day… Guess what I saw!! My upperclassman… in class, after school… pleasuring herself. As the pure, clean image of my upperclassman crumbled thunderously, I overheard a sweet whisper. A lovestruck girl who loves her Onee-sama. A student at the Saint Michael Girls’ School, or St. Michael’s for short. 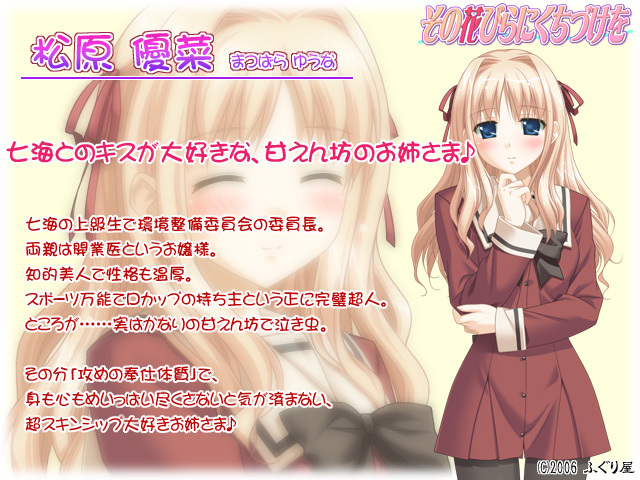 She idolizes her upperclassman, Yuuna, and quickly gets close to her over the course of being admitted to her committee! Her head is always full of romantic fantasies about Yuuna! When she discovers Yuuna isn’t like she pictured her, her lovestruck personality just makes her fall for her all over again. 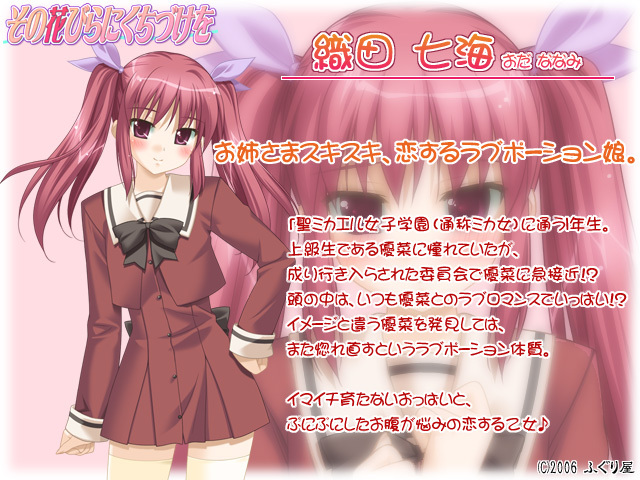 Chairperson of the Campus Improvement Committee, and Nanami’s upperclassman. A rich girl with two doctors for parents. She has brains and beauty, with a gentle disposition. Athletic and sporting a D-cup, she’s the perfect superwoman. But… she’s actually pretty needy and tearful. ※For Vista, the download version is fully supported. The packaged version must be run in compatibility mode.